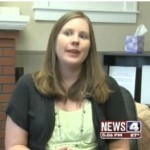 Social worker Erin Strohbehn. Screen capture courtesy of KMOV TV. Figuring out whether your child’s caregiver is abusing them is difficult because the signs often do not begin until after abuse has already begun, social worker Erin Strohbehn told KMOV TV in St. Louis. The TV station interviewed Strohbehn after Anna Bahr, 22, was given five years probation for breaking the leg of a 16-month-old child in her care. Bahr also can no longer babysit children. Parents should be concerned if a caregiver is not excited, engaged and happy to be with their baby, Strohbehn said. They should worry if the person constantly speaks negatively about their child, she said. And parents should look out for bruises and cuts in places other than where children usually fall and have scraps, such as the elbows and knees, Strohbehn said. Social workers help children and their parents overcome life’s challenges. To learn more visit the National Association of Social Workers’ “Help Starts Here” Kids and Families website.